Summary:The Potsdam Echelle Polarimetric and Spectroscopic Instrument (PEPSI) at the Large Binocular Telescope (LBT) in Arizona released its first image of the surface magnetic field of another star. In a paper in the European journal Astronomy & Astrophysics, the PEPSI team presents a so-called Zeeman-Doppler-Image (ZDI) of the surface of the magnetically active star II Pegasi. A special technique allows astronomers to resolve the surfaces of faraway stars. Those are otherwise only seen as point sources, even in the largest telescopes and interferometers. 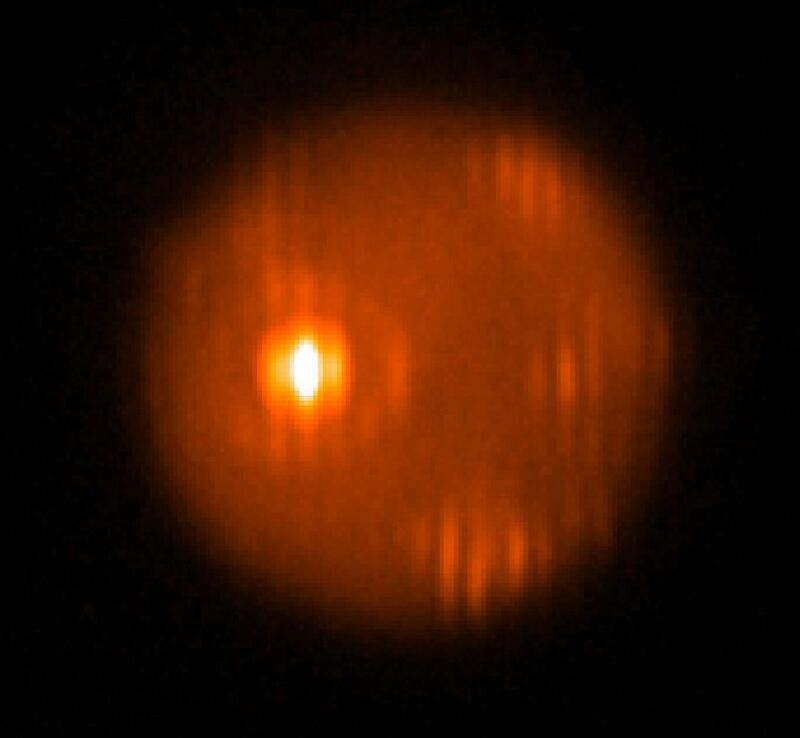 This technique, referred to as Doppler imaging (DI) or Doppler tomography, requires a high-resolution spectrograph, usually a large telescope, lots of observing time, and nifty analysis software. Each atomic spectral line can be seen as a compressed one-dimensional “image” of the stellar surface, which, if the star rotates, becomes broadened by the Doppler-effect. If a star has spots on its surface, just like our Sun has sunspots, the Doppler-broadened spectral line profiles will be selectively deformed. A time series of such spectral line profiles taken over a full stellar rotation can then be converted to a temperature (or brightness) image of the otherwise unresolved stellar surface, just like in medical brain tomography. But PEPSI can go a major step further. Because its two polarimeters also feed polarized light to the spectrograph, PEPSI captures the otherwise hidden profile deformation due to the Zeeman-effect. The Zeeman-effect is the splitting and polarization of spectral lines due to an external magnetic field. 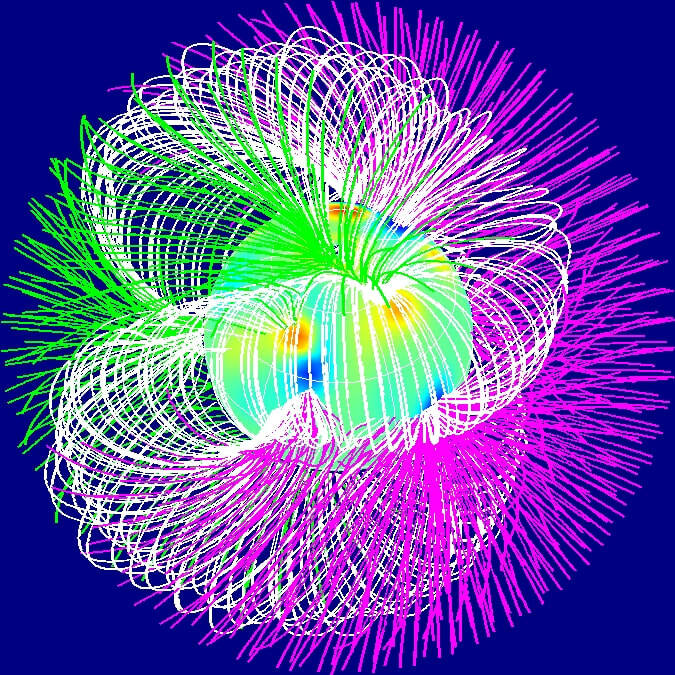 Combined with the rotational Doppler-effect it allows the reconstruction of the star’s surface magnetic field geometry. The cartography in polarized light is thus called Zeeman-Doppler-Imaging or in short just ZDI. 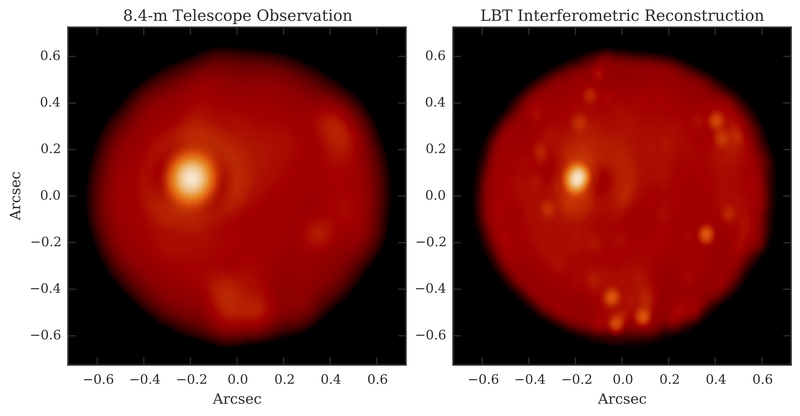 In a dedicated observing run with PEPSI attached to the effective 11.8m LBT a team of AIP astronomers was able to obtain a unique time series of polarized high-resolution spectra of the rotating star II Pegasi (HD 224085). “II Peg has a rotation period of 6.7 days and is thus manageable with the LBT in terms of the required observing time”, says the PEPSI Principal Investigator (PI) and author of the II Peg study Prof. Klaus Strassmeier from the Leibniz Institute for Astrophysics in Potsdam, Germany (AIP). “And with seven clear nights we were very lucky as well”, adds the PEPSI project scientist Ilya Ilyin. The already complex polarized spectra were analyzed with the special inverse mapping code iMap developed at the AIP. Once applied the surprise was big when warm and cool starspots were reconstructed from the PEPSI data and that these appeared with opposite polarity. “The warm features had positive polarity on II Peg while most of the cool feature had negative or mixed polarity”, says iMap-PI Thorsten Carroll. 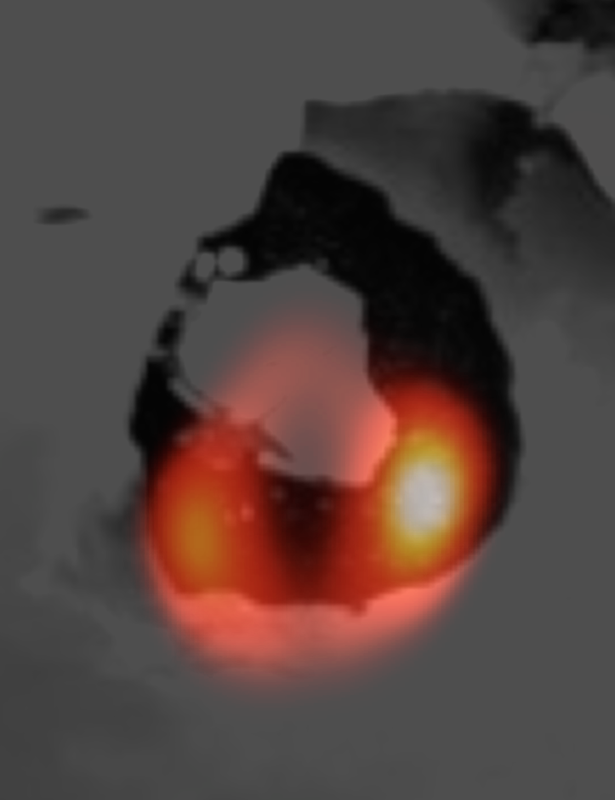 The spot distribution on II Peg has no direct analogy on the Sun. The individual spots found on this star are huge compared to the Sun, about thousand times larger than sunspots. “ “We explain the co-existing warm spots of II Peg due to heating by a shock front caused by the plasma flow between regions of different polarities”, concludes Strassmeier. "Both as a spectrograph and as a spectropolarimeter, PEPSI is unique in today's worldwide suite of astronomical instruments and will make significant contributions to stellar physics", adds Christian Veillet, LBT Observatory's Director. "The need to characterize the stars hosting exoplanets, as well as the planets themselves through transit observations, should also make PEPSI a sought-after instrument to the members of the LBT community."